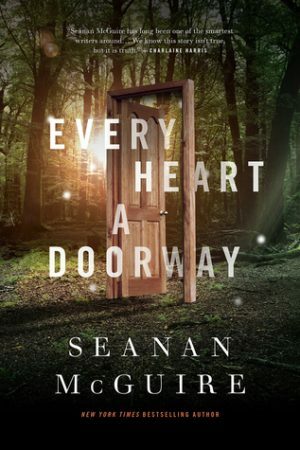 Every Heart a Doorway is a novella written by Seanan McGuire. This is a tale where all the doors to other worlds are real. The Narnia’s, the Wonderlands – all of these exist. But this isn’t a story of wonderful fantasy lands and the little girls and boys who fall into them. This is a story of what happens afterwards, once they fall back into our world sometimes older, perhaps a little wiser, but most definitely changed. The premise for Every Heart a Doorway is utterly wonderful. This story takes place at Eleanor West’s Home for Wayward Children, run by Eleanor West, an extremely elderly woman who once fell through a doorway of her own. It is a school for people like her, people who went to other worlds and have returned to our own, usually not of their own volition. Here they will learn how to cope with being away from what is now home. After all, only a very few ever wind up going back. This is a beautifully written tale with a lot of heart. The prose is absolutely gorgeous. I’ve never read any of McQuire’s work before, but I will definitely be seeking out more. There is a definitely fairy tale-esque air to the book. It has the same sort of magical whimsy that writers such as Neil Gaiman tend to touch upon in their novels. The main character in this story is Nancy, a girl who found herself in one of these other worlds. Her parents don’t understand what happened to her and only want her to return to normal. Of course, this is as impossible for her as it is for everyone else who attends the school. When she arrives, Nancy finds many other children like her. They’ve all been to wondrous, if extremely different, places. They’ve all been unable to rejoin society or their families in one way or another. But things aren’t as safe at Eleanor West’s School for Wayward Children as they once were. Nancy and her fellow students must come together before it’s too late. I feel a bit divided about this book. On the one hand I genuinely like it. I really enjoyed reading this novella and would probably pick it up again for a second read through. However, there were a few issues I had with it, forcing me to award less stars than I originally thought when first picking up the book. But first, the good: the characters. The cast is a diverse one. Each character landed in a very different world. Nancy went to an Underworld. Sumi went to a world filled with Whimsy, a place not dissimilar to Wonderland. Not only are the characters very diverse in terms of fantasy worlds and their personality changing affects, they are very diverse in race, gender, and sexuality as well, with two of the main characters being asexual and transsexual. While I love the premise of the story, I do feel as though it wasn’t used to its full potential. We clearly see the effects these other worlds have on the main characters and their families sometimes horrible reactions to their reappearances, but there was really very little in terms of true character development. I didn’t feel like many of the characters changed at all during their stay at the boarding school. None of them seemed to really get much out of the experience, at least. Upon first glance I was fine with the cliques. Schools everywhere are like that. It isn’t something you can get away from. However, it is mentioned in more than one place that not all of these children are all that young. Some, like Jack and Jill, reappeared years later, much older than when they left. Others may have reappeared immediately, but had spent many years living in another world. Another issue I had was this: why was everyone so terrified when the first murder happened? Now, I know how that sounds. Who wouldn’t be terrified when a murder takes place in a school, a center of learning and safety. Well, scores of people who went to other worlds, saw wondrous and terrifying things, and presumable defeated evils and went on adventures in these other lands, places which they think of as their true home. That’s who. I was surprised with the suspicion most of the students looked at each other with. I was even more surprised at the majority of the school’s lack of willingness to do anything about it. If anything this should have made a good number of the students feel right at home, with something they could maybe help with instead of feeling like an outsider trapped in someone else’s world as most of them did. Now, yes. I know not everyone went to a place like Middle Earth. Most of them probably didn’t save the universe as we know it. But Alice and the Pevensies’ defeated evil in their adventures. So why was everyone so unwilling to do so again? In truth, it was the ending which really didn’t work for me. I’m not going to leave any spoilers, but lets just say that most of the characters didn’t learn anything. I was expecting more a change in some of the characters. Some real, visible character development. I felt like I got very little of that, especially with Nancy. There is another book coming out in the series, set to be released later this year. As far as I am aware it will be more of a prequel, telling the story of Jack and Jill before they arrived at the school. This is definitely something I am willing to read more about. While the language was beautiful, and the characters well designed, overall I found the ending unsatisfying and some of the motivations, or lack thereof, questionable. I will continue reading this series, and do look forward to the next book. However, I found I could not award it as many stars as I initially expected when I opened the book. If you enjoy young adult novels and whimsical fantasy, give Every Heart A Doorway a try.